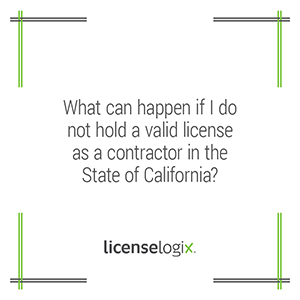 Valid business license as a contractor in the State of California? Not having a valid contractor license may require a contractor to return all compensation paid by the owner. The lack of a valid license may create a complete defense for the owner to any type of action brought by a contractor for compensation, even if the owner knew the contractor was unlicensed. Being non-compliant with licensing, including failure to properly renew a license could subject a contractor to criminal and civil penalties. LicenseLogix can help you obtain a license for the first time or manage your industry license renewals to help your company stay compliant. You can also sign up for CLiC, an easy way to manage multiple licenses in multiple states. For additional help you can click contact us, or give us a call at (800) 292-0909.